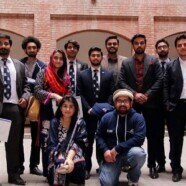 Forman Lahore Debate Open 2018 checked off all the prerequisites required to have a successful debating event. 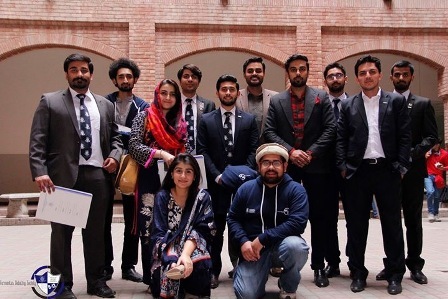 A heated debating session went down in 3 days that had the host team on their toes and the participants fighting for the bigger goal; the goal of manifesting themselves as the team that walks away with the winner trophy. The event took place between the dates of 16 and 19 February 2018, with over 50 teams participating. Formanites Debating Society had to cater to every nook and crook that demanded attention. Needless to say, the team was successful in giving an outstanding event followed by appreciation from every person that witnessed the event in its full swing. The perfectly calculated host team’s integration and communication with each other played a huge role in making the event stand out. You could actually see the Usher Head coordinating with the Accommodations Head, the Registrations Team working with the Publications team and the President along with the Event Coordinator running around, making sure everything was in place. Without a doubt the Host team gave the phrase ‘United we stand and divided we fall’ the perfect definition in action. The first day kicked off as the teams started rolling around 2 pm, registering them was a milestone on its own, by the time all of the teams were registered, it was 4pm. 5 pm marked the official start of the event, with the motion announced for both the sides of English and Urdu parliamentary, the participants went ahead and started giving their best, followed by another draw that lead to the round 2, the teams were exhausted by this time but their spirits were as high as they could be, even Razi Ahmed Khan from the Opening Government fell asleep forgetting he is the second speaker for the same motion. The 2 rounds came to an end and the teams were sent on their way to their homes to be back yet again with a fire that called for the next 4 rounds that took place on the 17 February. The round 3 kicked off at 11 am and Hamza Dar from Fast A had a lot to say on how ’Guns do not promote better safety, but they will kill all kinds of minorities, making the idea sound rather bizarre’. Whilst the round went on, a senior member of the Formanites debating society went in E 25 thinking there was a match going on and asked ‘ Batiyan kyun band hain, yahan kia ho raha hai’, with this the round 3 came to an end and the motion for Round 4 was announced around 2 pm and we could see an unknown speaker claiming ‘Sexuality as not a choice but a disorder’, LUMS A Opening Government also quoted that ‘ Facebook does not want its viewership to go down so it wants every post on it to be factually correct and they make sure of it’ . With the conclusion of round 4, came the most appealing announcement of food that was being served in Sinclair. After filling our tummies, the topic for quarters was announced at around 6 pm, Outsiders A on the opening opposition raised a rhetoric question ‘Western model is bad? 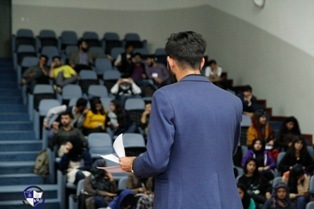 Because it profits us?’ The quarters went on for another hour or so and the the motion for the semi finals was announced where Formanites Debating Society’s Vice President Ahsan Sheikh lost himself to sleep as the debates gained momentum in the debate rooms. The 2nd day ended with 4 rounds of parliamentary debating in tow. 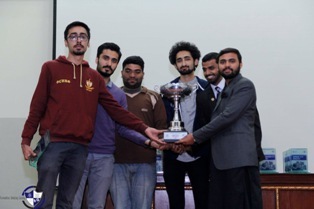 Forman Lahore Debate OPEN 2018 ended on a promise to bring a bigger and better event next year whilst the host team huddled across the stage for the host team picture, with smiles adorning their faces, smiling at all that hard work that paid off.